had to choose one or the other, I usually chose the Beautiful. Hermann Klaus Hugo Weyl (1885-1955). German mathematical physicist. In 1918, proposed an early form of gauge symmetry in an attempt to unify electrodynamics and gravitation. Subsequently applied a similar approach to quantum physics and discovered what is today considered one of the most profound and beautiful concepts in modern physics -- the principle of gauge invariance. Shortly after Einstein announced his theory of general relativity (gravitation) in November 1915, Weyl began an intensive study of the theory's mathematics and was soon publishing related scientific papers dealing with its physical applications. 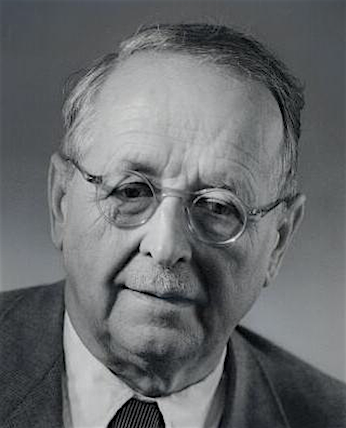 In 1918 Weyl published his book Raum-Zeit-Materie (Space-Time-Matter), which provided the first fully comprehensive analysis of the geometric aspects of the theory and its relationship with spacetime physics. One of the topics covered in the book was Weyl's idea that gravity and electromagnetism might both be derivable from a generalization of Riemannian geometry, the mathematical basis from which Einstein had developed his relativity theory. Weyl's idea was based on a new mathematical symmetry that he called gauge invariance. But Gravitation is not an easy read, and I had to look for more introductory texts. I soon came across Adler/Bazin/Schiffer's Introduction to General Relativity, which besides being easier had a chapter on unified field theory, including Weyl's 1918 theory of the combined gravitational-electromagnetic field. For whatever reason, the theory's mathematical beauty absolutely fascinated me. I had known about local and global phase invariance from my studies of quantum mechanics, but I was not aware that Weyl's theory was the origin of this powerful symmetry principle in quantum physics. I have since read all of Weyl's books and many of his papers. Although today I believe that my interest is now based more on an appreciation of modern gauge theory (easily the most profound and beautiful concept of physics), I credit Weyl for having initiated the idea in 1918 and for his subsequent (1929) seminal application of the idea to the then still-developing quantum theory. The past 25 years have seen the rise of gauge theories--Kaluza-Klein models of high dimensions, string theories, and now M-theory, as physicists grapple with the challenge of combining all the basic forces of nature into one all embracing theory. This requires sophisticated mathematics involving Lie groups, manifolds, differential operators, all of which are part of Weyl's inheritance. There is no doubt that he would have been an enthusiastic supporter and admirer of this fusion of mathematics and physics. No other mathematician could claim to have initiated more of the theories that are now being explored. His vision has stood the test of time. Weyl was an exceptionally gifted mathematician and physicist, but he was also a highly cultured man in the classical German tradition. He studied and wrote extensively on philosophy and was a serious student of German poetry and literature. His mathematical writing style could be exceedingly obtuse, but his other writings reveal a genuinely warm person who truly understood the human condition. Weyl was also very human himself; he could be overly thoughtful and cautious, often to the point of being unable to take action or make even basic decisions, and sometimes with the result that he became physically incapacitated. He was a devoted and loving husband and father, yet he could also be persuaded to stray, in accordance with the surprisingly liberal attitudes of post-World War I Weimar society. This website is my feeble attempt to document (and in many cases expand on) Weyl's ideas and thoughts on gauge symmetry in a manner that will be accessible to anyone with a basic understanding of calculus. Not a lot has been written about the original theory's underlying mathematics, and I wanted to provide a fairly detailed and complete mathematical description for those who want to learn about Weyl's ideas and to appreciate the beauty of his gauge theory (I'm even of the opinion that much of Weyl's work can be understood and appreciated at the high school/beginning university level). As this site progresses, I will also include discussions of other topics in mathematical physics (as well as some related scientific philosophy) which exhibit a similar mathematical beauty and elegance. Note: I no longer post to this site. See AfterMath for what I'm doing now.